From left, Board Vice Chairman Fred Roberts Jr., Board member Douglas Bournique, Division of Water and Land Resources Director Dr. Erich Marzolf, Board Chairman John Miklos, District Executive Director Dr. Ann Shortelle, Board Secretary Chuck Drake, Board member Janet Price, Board Treasurer Ron Howse and Board member Allan Roberts. PALATKA, Fla., June 12, 2018 ― With nearly 1,500 lakes within its boundaries, the St. Johns River Water Management District will recognize July 2018 as Lakes Appreciation Month to increase public awareness about the value of Florida’s lakes and to encourage behaviors that will enhance lakes’ health. The district’s Governing Board approved a proclamation at its meeting on Tuesday. Marzolf represents Alabama, Florida, Georgia, Kentucky, Mississippi, North Carolina, South Carolina and Tennessee on the NALMS board. 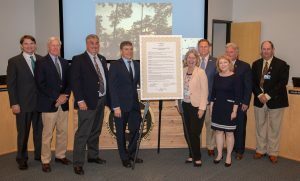 The St. Johns District joins other Florida water management districts in recognizing Lakes Appreciation Month, and NALMS annually proclaims July as Lakes Appreciation Month. The intent of the annual resolution is to raise awareness of the importance and benefits lakes provide. In addition, NALMS conducts its annual Secchi Dip-In each July. Started in the United States, the Secchi Dip-In is now an international effort in which volunteers produce a “snapshot” of water transparency in lakes around the world. For information about waterways within the district, visit www.sjrwmd.com/waterways/.